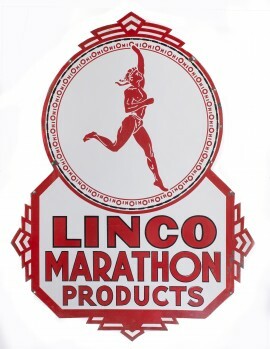 Double sided porcelain die cut sign for Linco Marathon Products. 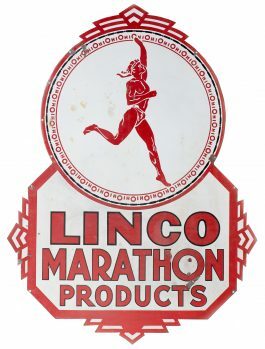 This is a truly tough sign to find and this is what we believe is the rarest of three versions for Linco, Marathon and this Linco Marathon Products naming. This sign features the great Greek runner graphics with OhiO border since the brand and company were owned by Ohio Oil Company after the breakup of Standard Oil. The Art Deco style border and die cut shape are about as great of a graphic look as you could hope to find in this wonderful red and white color scheme. Side 1 is in very good condition with strong colors and gloss with only a few small minor chips around the edges and at mounting holes. Side 2 has some surface discoloration and a couple spots that look like they have been touched up and a couple small chips in the field. Size: 32" x 57"